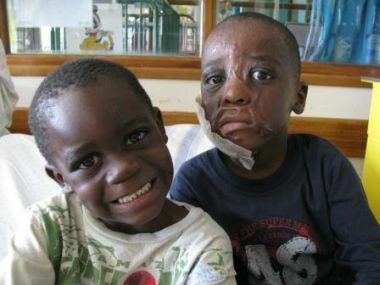 Tavonga and little Bongani with their new pressure garments from Netcare Rehabilitation Hospital, in August 2010. 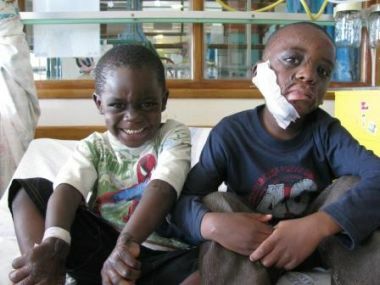 Tavonga Chikwenya, in Cape Town�s Red Cross Hospital with his friend Sunday Mukazi and Carer Tracey Burns in April 2009. 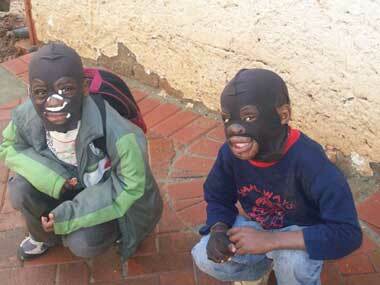 They enjoyed the attention and the laughter and were kept pretty active. 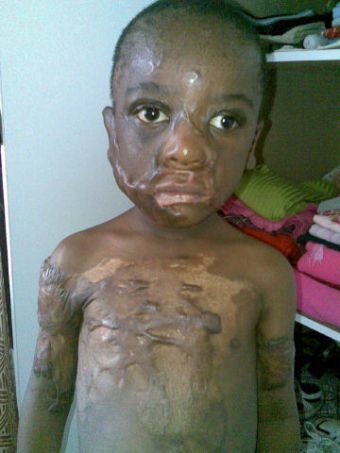 Tavonga got quite tearful at first, asking after his mum, and saying he wanted to go home. 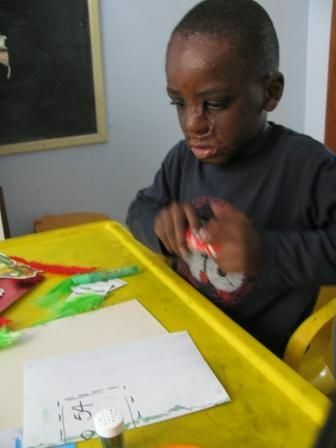 He started to learn the art of letter writing and looked forward to it. 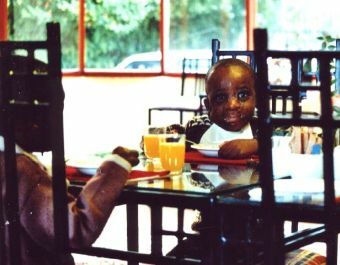 Both boys enjoyed taking photos a lot. 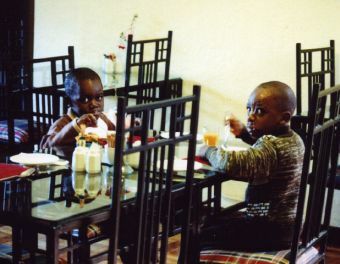 Tavonga writing home to Bronwen (Mama) and to his Mum as well Tavonga follows Children of Fire's 'clean plate' policy. 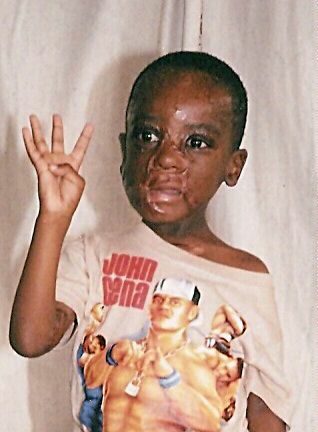 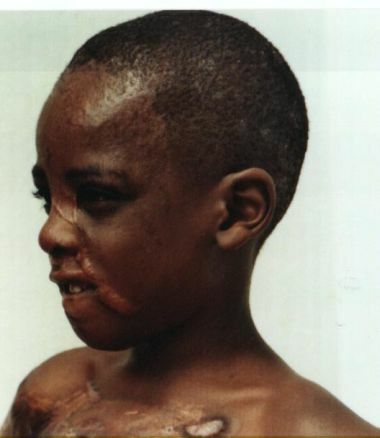 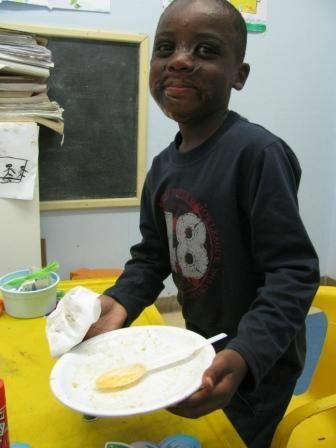 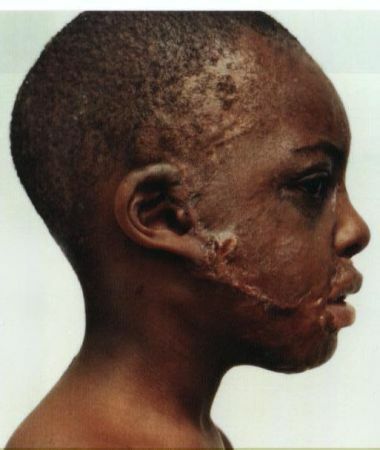 Tavonga Chikwenya (6) was burned with hot rice as a toddler in Zimbabwe. 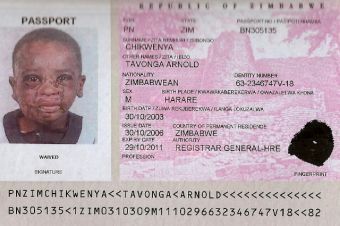 He now lives in South Africa with his family (mother, father and sister), legally. 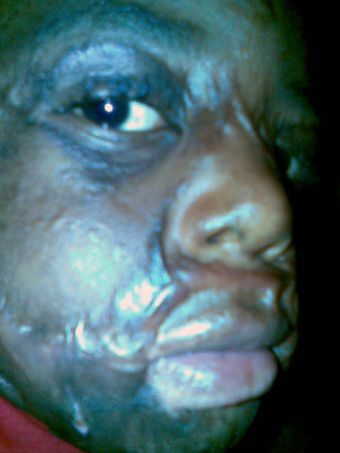 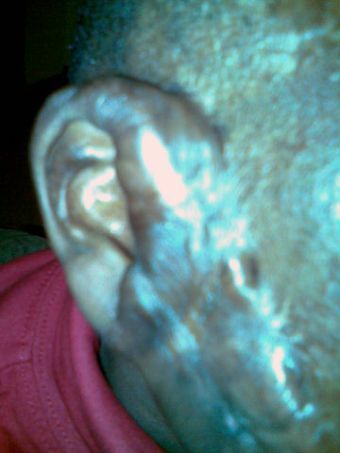 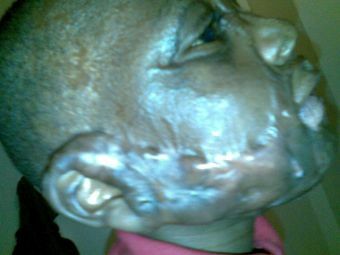 He had attempted keloid removal in Zimbabwe but the raised scars reoccurred in a worse form. 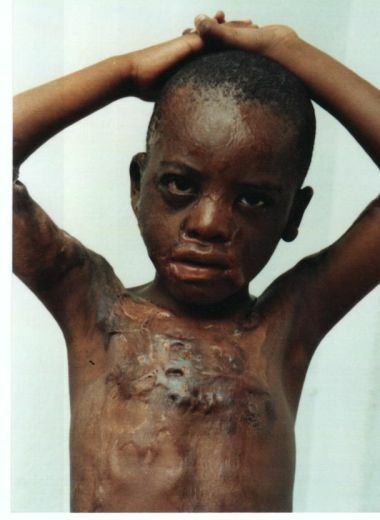 He also had a blood transfusion in Zimbabwe. 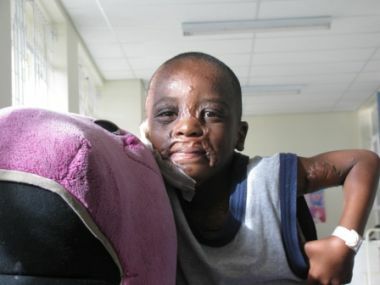 Tavonga saw children 'just like me' when the South African Sunday Times carried an article about Children of Fire in November 2008 and so he came to see us. 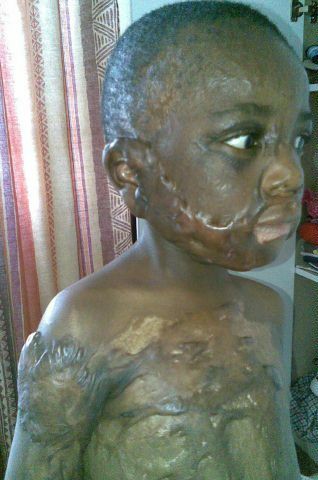 In Johannesburg the plastic surgeons would not assist to alleviate his sadness at terribly-raised scars. 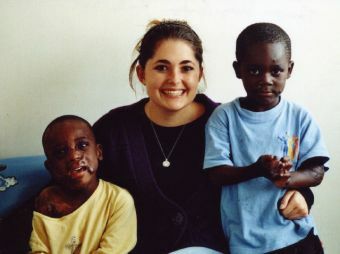 Sometimes the most important procedure for these children is to give them hope. 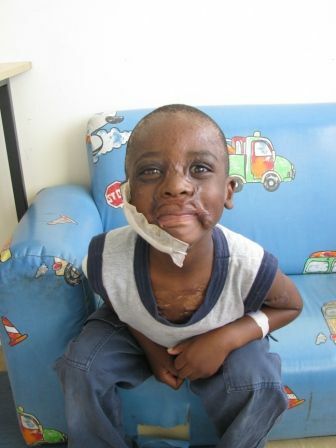 Professor Heinz Rode at the Red Cross Children's War Memorial Hospital in Cape Town took on his care. 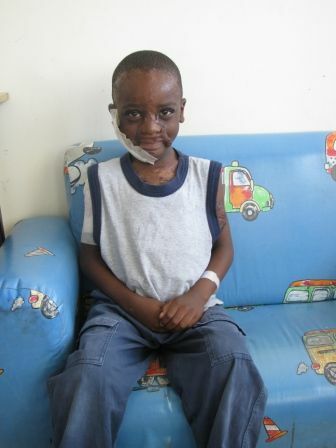 From April 2009 til late 2009, Tavonga underwent a series of operations at that hospital. 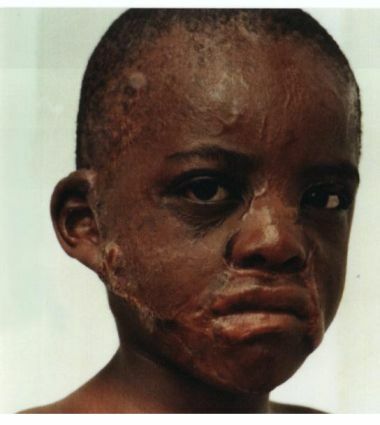 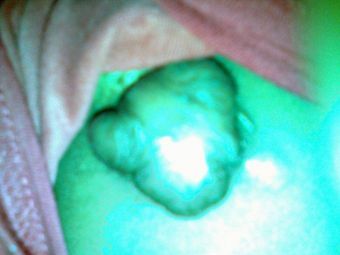 He has keloids removed, bleumycin injections, pressure garments for face and chest. 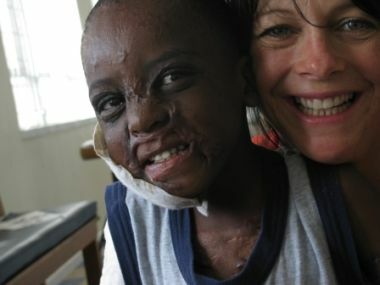 He also has a squint surgically realigned. 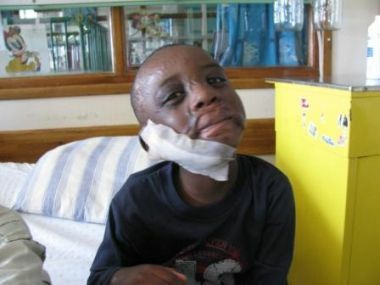 All this was possible not just with the kindness of the hospital; the very loving staff in ward C2, but also the stunning help of Cape Town volunteer Ms Tracey Burns. 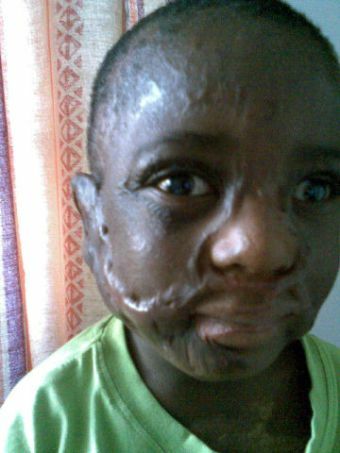 It is not guaranteed that the keloids will not reoccur, but with careful use of massage, pressure garments, topical antibiotics, Bio-Oil and every medical and social endeavour, we hope that Tavonga will keep his current handsome and only mildly-scarred face. 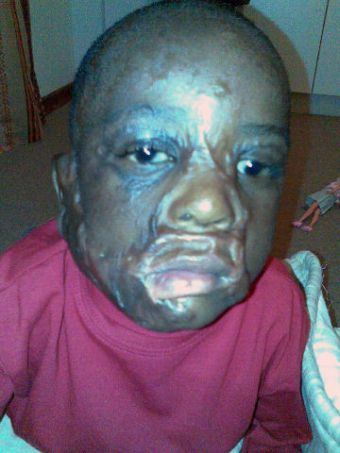 He matured enormously during his time in Cape Town and became a firm 'brother' to DRC war-burns-survivor Sunday Mukhazi aged 5, who also remained for some six or more months in the 'mother city' of South Africa. 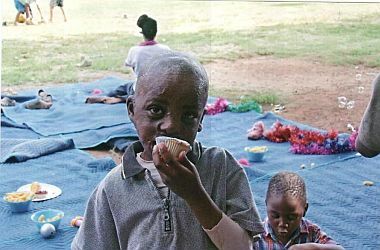 On return to Johannesburg, Tavonga had a disturbing raised gland problem in his neck which with one of our other children had indicated the onset of HIV-Aids. 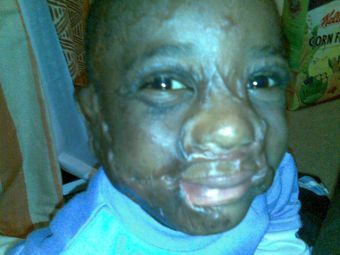 While both his parents knew that they were HIV negative, there was concern because of the blood transfusion in the past. 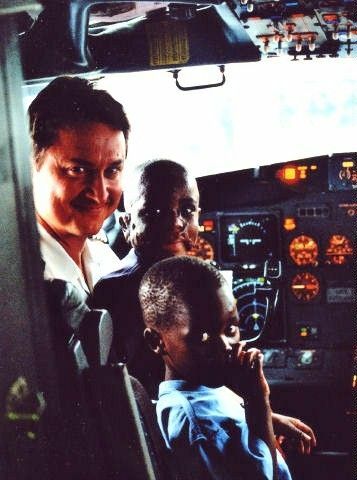 Dr Peter Cole of Lancet Laboratories authorised an HIV test and we took an extra tube of blood in case the news was bad (so that we could then test for the CD4 count without more painful needles). 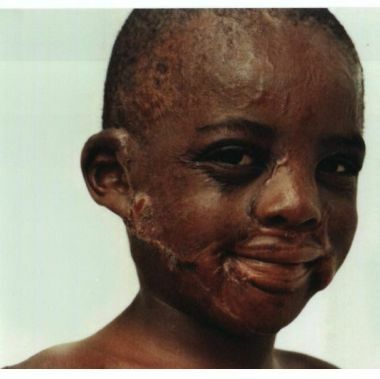 A good Christmas present for Tavonga's family was to learn that he is HIV negative and that the neck glands issue is something separate and less hazardous to health.